Buddy Rice backed up his pole position performance with a dominating drive to win the 88th Indianapolis 500 in what turned out to be a Honda benefit at 16th & Georgetown. In a race shortened 20 laps by violent thunderstorms, the rain couldn’t deny Rice’s reign, as the 28-year-old native of Phoenix led 91 laps in his Argent/Pioneer G-Force to score Honda’s initial triumph in “The Greatest Spectacle in Racing” for Rahal Letterman Racing. 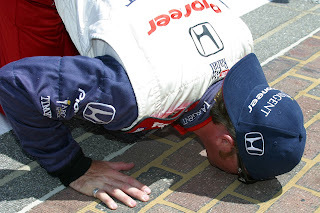 So decisive was Honda’s month-long dominance that it swept the top seven spots at Tony Kanaan, Dan Wheldon, Bryan Herta, Bruno Junqueira, Vitor Meira and Adrian Fernandez trailed Rice under the checkered flag. The lone scare of his race came with Buddy stalled on a Lap 94 pit stop and dropped back to 16th. He flexed his muscles on a Lap 138 restart by charging from sixth to first in 14 laps. “Once I got back in front, I caught a couple of breaks in traffic. I made a late pass on somebody and that got Tony bottled up and gave me a little cushion,” said Rice, who owned a three-second lead when the skies opened up. 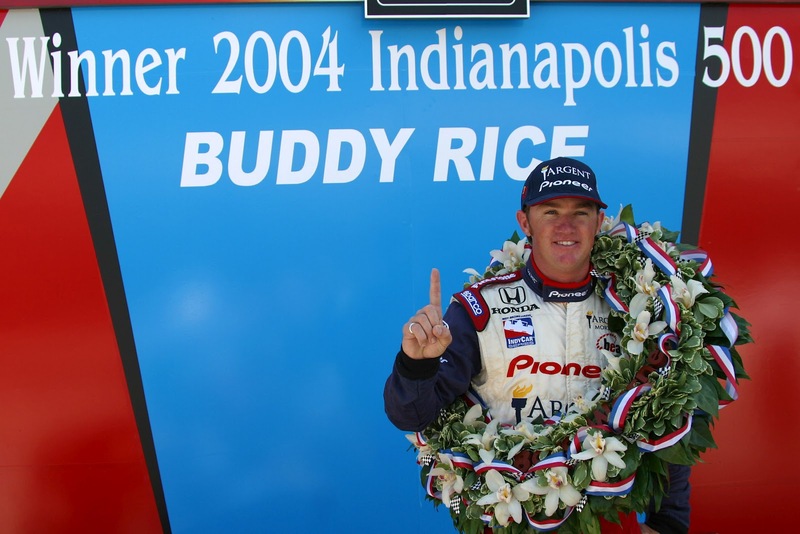 The only other drivers to keep Rice honest all afternoon were Andretti Green Racing teammates Kanaan and Wheldon, but both conceded the right guy would up in Victory Lane. “Buddy was much stronger today and I thought he deserved it,’ said Kanaan, who led 28 laps in the 7-Eleven Dallara/Honda. Herta, in the XM Satellite Radio Dallara/Honda, gave Andretti Green Racing a 2-3-4 performance and the 2002 Indy Polesitter Junqueira came home fifth in the Newman/Haas Racing PacifiCare G-Force/Honda. Meira gave Rahal Letterman a solid sixth place in the Team Centrix G-Force/Honda while Fernandez started sixth and would up seventh in the Quaker State-Tecate-Telmex G-Force/Honda. 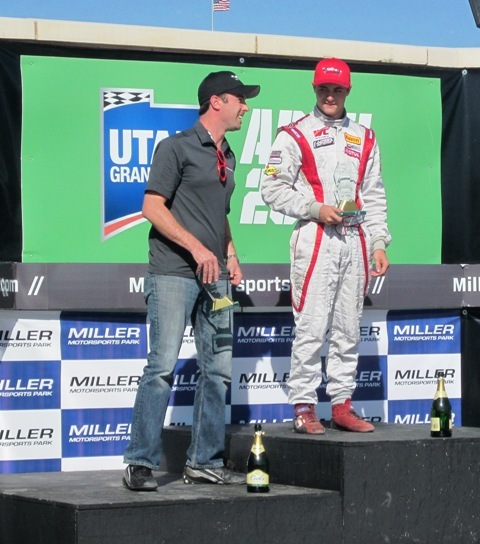 B-Spec, a new and more affordable form of Touring Car racing, made its professional debut April 28-29 with multiple events on both the East Coast and in the Western U.S. At Miller Motorsports Park in Utah, Honda’s Sage Marie led a 1-2 finish for Honda in his B-Spec Fit in Sunday’s weekend finale. An eight-car field, including a pair of Honda Fits, was on the grid at Miller for the inaugural three B-Spec races held as part of the SCCA Pirelli World Challenge weekend. Across the country, at Homestead-Miami Speedway in Florida, another eight B-Spec machines turned up for the first “Sportsman Showcase” B-Spec race as part of the Grand-Am Continental Tire Challenge Series. 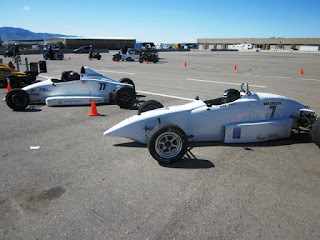 Marie finished fourth in both of the two races on Saturday at Miller, as he dialed in the handling of his B-Spec Fit. Connor Ford, driving a second Fit in addition to racing in the companion Formula F races, finished fifth in the opener, but did not start the second round. On Sunday, Marie was part of a four-car battle for the lead in the early laps, but then pulled away to a 3.354-second margin of victory as the others challenged for what became second place. Ford’s Fit prevailed in that battle, just ahead of the Fiesta of Craig Capaldi and Jonathan Start’s Fiat 500, to make it a 1-2 finish for Honda. “It’s good for Honda Performance Development, it’s good for Honda and it’s good for the class,” Marie said after scoring his first B-Spec victory. “All the difference in the world today, with some fresh tires up front and some [air] pressure changes. The Pirellis worked much, much better today, and made it much easier to balance the car and put down some good, consistent lap times. “I watched those guys battle behind me, the three of them, and I loved watching them battle back-and-forth, because I was just notching away tenths of a second each lap. I’m very happy,” Marie continued. “The Fit's top-in-class performance on the track demonstrates that its versatility extends well beyond great packaging and fuel economy,” commented Michael Accavitti, vice president of national marketing operations for American Honda. In addition to the pair of Honda Fits, the eight-car B-Spec field at Miller included a pair of Ford Fiestas, two Kia Rios, a Fiat 500 and a Mazda2. All entries use stock engines and chassis, fitted with a competition roll cage, competition seat and other safety equipment, and manufacturer-approved suspension components, tires and wheels. Weights and other variables are used to balance competition between the manufacturers, and the target cost for a race-ready car is $25,000-$30,000. 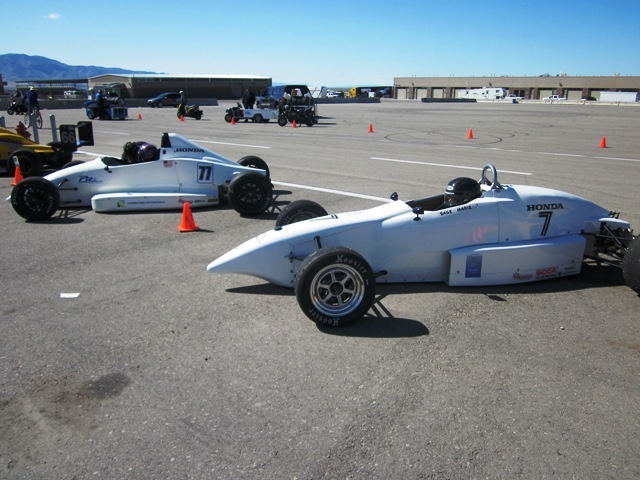 B-Spec racing will continue this season at select events in both the SCCA and Grand-Am series. 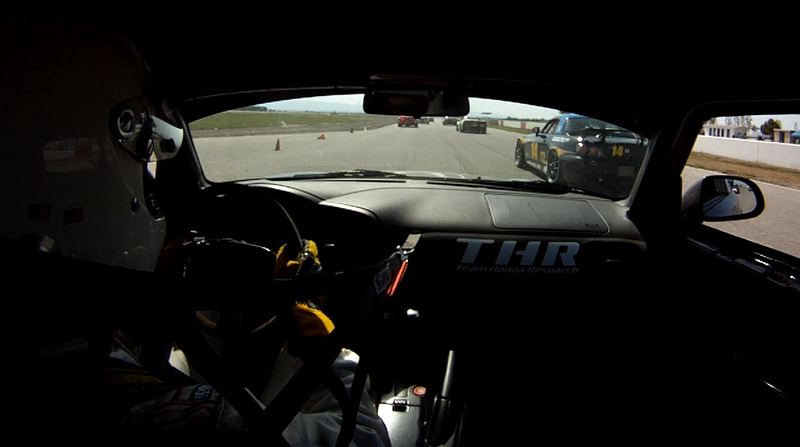 In addition, the category will be part of the Canadian Touring Car Championship and is approved for competition in SCCA Club Racing. Conner Ford took over the 2012 Corsa Car Care presents Pacific Formula F Super Series championship points lead with a pair of victories April 28-29 at Miller Motorsports Park in Utah. Ford and his PR1 Honda Mygale were untouchable at Miller, qualifying on the pole for both races, leading series rookie Tommy Boileau home on Saturday; and heading Sage Marie, another first-time Formula F competitor, to the checkers in Sunday’s race. Ford’s pair of wins at Miller, combined with a win at the Willow Springs season opener, have vaulted him to an early-season lead in the Pacific Formula F Super Series standings, with 129 points to 57 for Ed Erlandson, who won the second of the two Willow rounds last month, but did not make the trip to Miller for Rounds 3-4. On Saturday, Ford went flag-to-flag for the victory over Boileau, a second-generation Honda racer and SCCA Showroom and Touring car veteran, who was making his open-wheel racing debut in a Honda-powered Piper Formula F.
In Sunday’s second round, Ford again dominated, recording his third victory in four starts this year and turning the tables on Marie, who earlier in the day had led Ford to a 1-2 finish for their Honda Fits in the new B-Spec race series at Miller. Next up for the Corsa Car Care presents Pacific Formula F Super Series is the May 19-20 doubleheader weekend at California’s Buttonwillow Raceway. More information on this exciting series is available at www.pacificF2000.com. Meanwhile, the eastern U.S.-based F1600 Formula F Championship Series resumes its own 10-race season May 25-26 at Lime Rock Park.